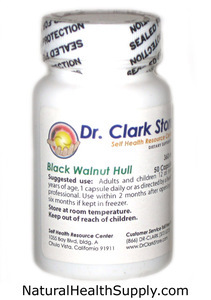 Ingredients: 360 mg of freeze dried green immature Black Walnut Hulls, peppermint leaves for flavor, gelatin capsules, guaranteed pure and potent from the Self Health Resource Center. Produced in small batch quantities. Each bottle contains 50 capsules. No binders, no coatings, no dye. Suggested Use: Adults and children 12 or more years of age, 1 capsule daily or as directed by a health professional. Use within 2 months after opening if stored at room temperature or 6 months if kept in freezer. Keep out of reach of children.